I used to perform in this skit when I was in high school that involved masks. We had these painted plaster masks we would hold over our faces that represented stereotypes or behaviors, and when we would take them off, there would just be intense pain beneath — the beauty queen thought she was ugly; the person who judged others couldn't even look at themselves in the mirror; the party animal was really suicidal. You can't live under a mask. You can try, but you can only do that for so long before one of two things happens: either you let the mask down and let others in, or you become the mask. Our guest star of the week, Human Target, tells Oliver something really poignant that he probably won't take to heart because it's Oliver: "No one moves forward in life when they're hiding behind a mask." The reality is that one or the other has to win, in the end. And sometimes the process of becoming the mask is so slow and subtle that before we realize it, we've become the very thing we're so used to hiding behind. Honestly, I wish "Human Target" was this deep of an episode. I wish that we spent less time on Tobias' incredibly underwhelming evil plot, Annoying Reporter Chick, and Felicity's new boo, and more time on what it means to live under a mask. We've recycled some plots in Arrow quite frequently, but we need to do more than just touch on the struggle Oliver is having between his mayoral identity and his hooded one. I mean, for goodness' sake, HE LITERALLY KILLS ONE OF HIS SELVES THIS WEEK SO HE CAN LIVE AS THE OTHER. DOESN'T THAT SEEM LIKE AN IMPORTANT THEMATIC ELEMENT TO EXPLORE? Anyway, Arrow has been pretty disappointing in the past few weeks and I don't know if it's just in the mood I'm in with the show, or if the quality of the writing has just maintained the sort of lukewarm level that neither entices nor aggravates me. If I had rage toward the episode, I would at least be feeling something. As of now, apathy is what "Human Target" left me with — in an episode that even Felicity couldn't fix. It's weird to me that we're five episodes into a twenty-some episode season and one of the Big Bads is already dead. I know that Prometheus is supposed to be this huge deal — and I made a lot of fuss last year about how badly the show paced Darhk's reveal, battle, and inevitable demise — but this feels like a re-tread. I'm not exactly sure how we're going to extend Prometheus throughout the entirety of the season, or if that's the plan at all for the writers. I wish I knew what the plan was, in terms of pacing this season. Maybe it would make me feel better about these medicore episodes. Arrow always has the potential to be great, but what it often fails to realize is that it also has equal potential to just be bad. Breaking up Oliver and Felicity wasn't a terrible choice (though the baby mama drama will, forever, send me into fits of rage)... if the show would spend some time throughout the next few episodes exploring that new relationship on a deeper level. We got a little bit of that in this episode but again, I feel like Oliver/Felicity is going the way of Havenrock — namely that it's being wrapped up in the course of ten minutes in order to make room for new things and other plot. Thin plot isn't bad if you have heavy character development to deflect to. If the show wanted the entirety of Tobias Church's evil scheme to really boil down to: "biggest drug lord ever," then they should have scattered that into an episode where Oliver struggles with his identity, or Human Target has a long monologue about masks. As it was, this episode felt very thin. There were some bright spots, which I'll talk about in a bit, but I just can't get over how poorly paced these five episodes have been. I wouldn't be as confused and frustrated by the pacing if this was a 13-episode Netflix series. But when you have sixteen or so episodes left with stories that are growing thinner by the minute, there's a problem. And part of me wonders if the issue here is the giant crossover that the shows are planning — if, like last year, the thing we were slowly building toward was the crossover, not the actual villain of the story. Arrow can be great if it learns where its weaknesses are. Chief among those are pacing and exposition. I tweeted this tonight but the fact that I couldn't remember exactly what Tobias' evil plan was and then he conveniently summed it up the very next moment when a bad guy asked him tells you everything you need to know about the writing of the episode. So with Tobias now dead (when does anyone make it to Iron Heights in a caravan, really? ), and an episode description telling me that Prometheus already knew Oliver was the Green Arrow because he has some personal vendetta against him, I'm not exactly sure what to expect throughout the next few episodes. While that might sound, on paper, like a good thing it's more — as I said earlier — problematic because my ambivalence is driving me further and further into just leaning on a crutch of tweetable Arrow reviews instead of real ones. So what were some of the better things in "Human Target"? The fact that Oliver and Felicity finally had to confront one another about their relationship! Felicity is dating Billy Malone, a cop who recently got promoted to the ACU — which is great for him, but bad for Felicity because it means he will be working with Oliver. When Human Target accidentally lets it slip to Oliver that Felicity is dating again, he confronts his former blonde flame about the relationship. They get interrupted by a call to take down Tobias, but return to their conversation the next day. Oliver expresses support for Felicity, and only a desire to see her happy. (And I roll my eyes because hopefully Oliver will learn, once and for all, that love begins with trust and honesty and transparency and important stuff like that.) The fact that Oliver is supportive means a lot to Felicity, and he tells her that he thinks she should take time to figure out if her relationship with Billy could turn into something serious. I don't think it will, but that's because his name is "Billy" and I can't take that seriously. He closes out their pep talk with the affirmation that he'll always care about her. That seems to soften Felicity, who babbles a little nervously before she leaves. While I expressed my frustrations above with the pacing and time devoted to this incredibly complex relationship, I'm glad these two had a mature adult conversation for once. Most of their relationship consisted of Oliver doing stupid things and Felicity trying to convince him to not do those stupid things again. This time, both parties walked away on equal footing, with mutual understanding, and the bud of trust forming once more. There was no yelling, no angst, and no blame. It's a nice change of pace for Oliver and I sincerely hope that time away from Felicity will continue to mature him. You have to realize what you've lost, buddy, and why you did before you can ever hope to get it... er, HER, back. I also really appreciated the bond between Diggle and Rene in this episode. Both men have been recently tortured and though they don't have much in common apart from that, they still are forced into a relationship. Rene thinks that he cannot do anything right and the fact that he gave up Oliver's identity as the Green Arrow (while being heavily tortured, mind you) is just another thing Rene blames himself for. But Diggle isn't here to play judge or jury like he usually has to with Oliver. Instead, he's there to offer guidance and support — he's Yoda again, guys! Diggle reveals his own pain and guilt to Rene, in order to get the young man to open up and trust him. When he does, Diggle decides to do an exercise to help Rene remember anything important from when he was tortured. It works! And just in time, too. What I enjoyed about this dynamic was that it was unexpectedly pleasant. Diggle wasn't gruff or yelling. He didn't automatically assume his soldier persona. Instead, he was calm and compassionate. That's the kind of Diggle I love and the one I sorely miss. Unfortunately, I have one hang-up with this whole Spartan story and it's the idea that putting on a suit helps you absolve your grief or guilt. 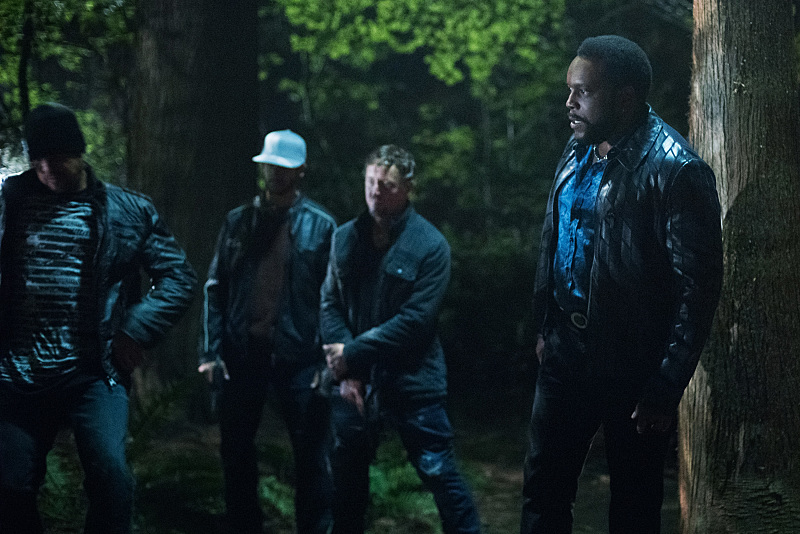 Diggle tells Rene to get back into the field, after the young man fears he'll screw up again. But it seems Diggle is also taking Oliver's words to heart and is choosing to pay for his crimes against Andy by suiting up. While I'm not necessarily opposed to this idea, per se, I am kind of baffled by the continual logic that superhero suits are the way to process emotion in a healthy manner. Didn't Oliver call Laurel out for doing the same thing Diggle is doing? Sure, Diggle feels guilt (primarily) where Laurel felt grief (primarily), but it's essentially the same concept: you suit up so you can feel, or not feel, something. It's such an interesting concept to me and one that every character seems to be hypocritical about. Just some food for thought, which I am sure you'll continue to chew in the comments below. "Human Target" is just another okay episode of Arrow. It's not great, and it's not making me excited for the remainder of the season. And when you're less than a quarter of the way through, that seems like a bad thing. Wil Travel was delightful in his short stint as Human Target. I loved him on Jessica Jones (what a performance), and loved him here. I have a qualm: Oliver revealing that he didn't fake his death after all means that Thea and/or Lance won't get to be mayor. I really just want Thea to be mayor. Please. What do I have to do to make that happen? "Do people just walk into your secret base of operations?" "Yes." RORY IS THE VOICE OF THE FANDOM. ALL OF THE TIME. "Have you ever — has he EVER — actually said that and it turn out to be true?" "Any advice?" "Don't... screw it up?" I absolutely love the sinister, creepy theme that Prometheus has. Blake Neely is so good. Annoying Reporter Chick doesn't even deserve a name. "Is this gonna be one of those hippy dippy meditation things?" I cackled. "I care about you. And I will always care about you." This week in Bratva-land, Oliver almost dies trying to save a girl. Some Russian stuff happens. To be honest, I'm getting bored of flashbacks already again. This isn't boding well for the rest of the seasons. Everyone being totally okay with the MAYOR OF THEIR CITY FAKING HIS OWN DEATH says a lot about the people who still live in Star(ling) City. What did you all think of "Human Target"? Sound off in the comments below! Just one thing to add: that reporter chick who doesn´t deserve a name is going to be the Isabel of this season, Oliver and her are going to have something, I can feel it, and then all the work the script writers did to bring the good Arrow back is going to go down the drain, just saying.